Inspired by a recent post on the Tracery Interiors blog, I've been noticing the quatrefoil motif more and more. I hadn't realized quite how prolific the motif is until I read their post and started paying attention a bit more. I would characterize the quatrefoil as being in the league of the greek key, appearing everywhere from architecture, to furniture, to lighting, to iron work, to textiles, even a business name. With my heightened attention, I've been amassing quite a collection of quatrefoil-inspired design. Along the way my appreciation for the design has grown. I enjoy it as a subtle detail that adds depth and whimsy. We'll start the tour of my collection of quatrefoil-inspired design with one of my most interesting recent finds. I was out exploring parts of Buckhead on my bicycle and strolled into a small cul-de-sac out of curiosity. 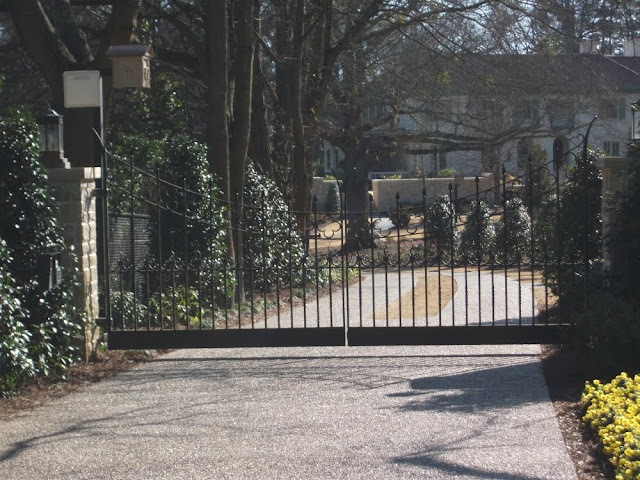 There I discovered the rear entrance to the estate of an Atlanta billionaire. It's kind of the secret bat cave exit I suppose. That wasn't what got my attention though. 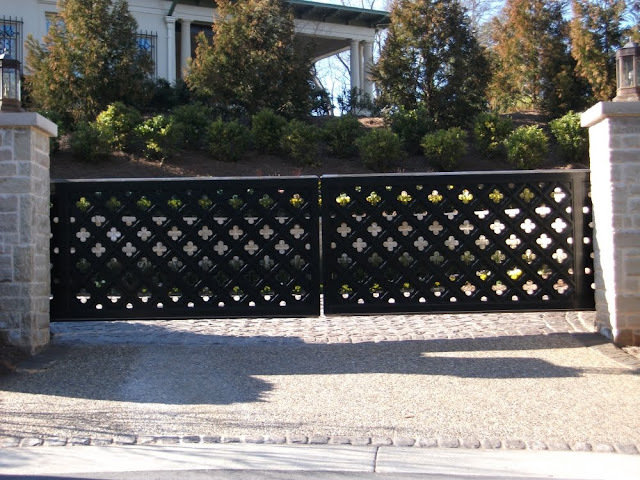 The entrances's gate perforated with quatrefoils did. At the time of discovery I didn't have my camera with me so I went back yesterday to get this picture. I decided to check out the front entrance instead, though, because there is full-time security sitting in a car by the back gate. I didn't want to raise any eyebrows for the sake of architectural tourism. I assumed the front gate would be of the same design. It wasn't the same, but it did indeed have the quatrefoil motif. You may have to enlarge this picture (by clicking on it) to see the quatrefoils. Of course, as you just saw, I risked upsetting the security detail and got the back entrance photo too. 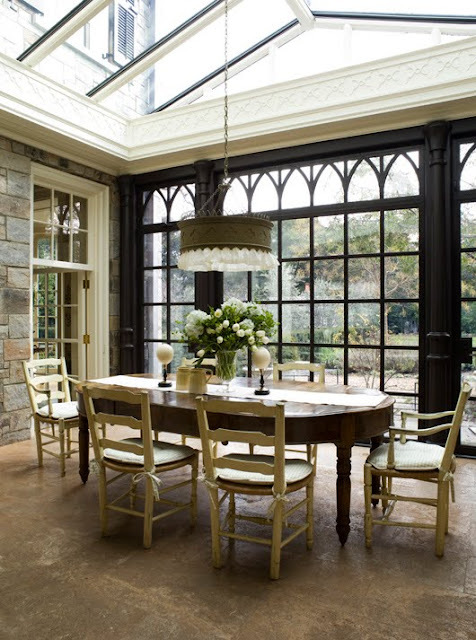 This house photographed by architectural photographer David Duncan Livingston is filled with Gothic motifs. The kitchen has Gothic arches in the cabinet windows, a large Gothic arched opening into the breakfast area, and there are qautrefoils everywhere. Quite unique are the quatrefoils embossed in the kitchen's crown molding. They also appear in the cabinetry woodwork above the sink. The quatrefoils are a dominant element in the light-showered breakfast area too. Notice them in the band ringing the chandelier and again in this room's trim molding. A perfect example of the quatrefoil adding a subtle bit of whimsy is this picture of a mirror from the Tracery Interiors portfolio. This is one of my favorite quatrefoil designs. The mirror could be used in so many places in various design schemes. 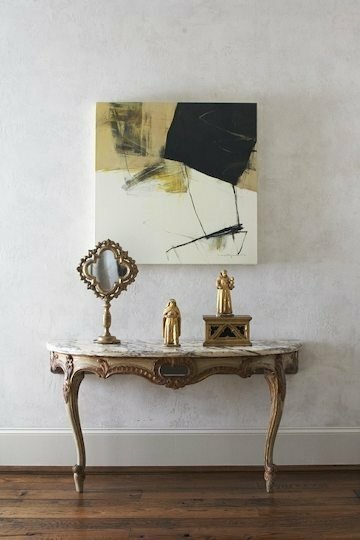 Another favored quaotrefoil design is this side table from Ironies. I think I may just have to get one of these tables. It would make a great night stand or occasional table in another room. 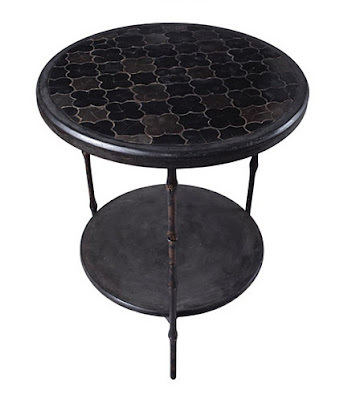 I recently found another quatrefoil-inspired side table on the katiedid blog. The table is made by Oomph and is available in several different hues. I like the white version in this bathroom. 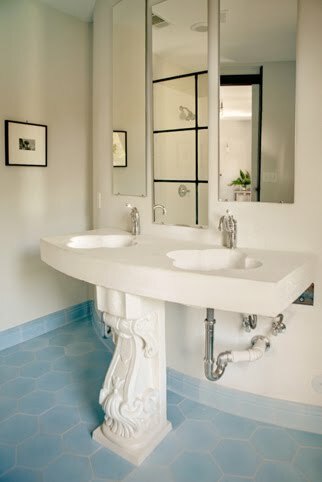 In the whimsical department is this pedestal sink with two carved quatrefoil bowls that I discovered on the desire to inspire blog. The house is actually a mission-style church that was converted into a castle by design firm Urban Nature Inc. The castle has several other quatrefoils in its design, paying further homage to the church it once was. The architecturally rich city of St. Petersburg, Russia has several unique bridges spanning the canal that runs through the city. I recently discovered this bridge while flipping through a magazine and it caught my eye because of the quatrefoils in the iron work. I could imagine this style railing in a residential setting, albeit in the more stereotypical black color of iron. 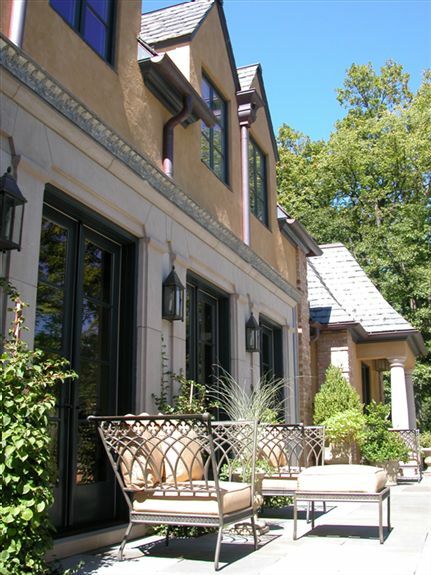 The Gothic-style patio furniture at this house designed and built by the Poulton Group has both the arch and quatrefoil motifs going. 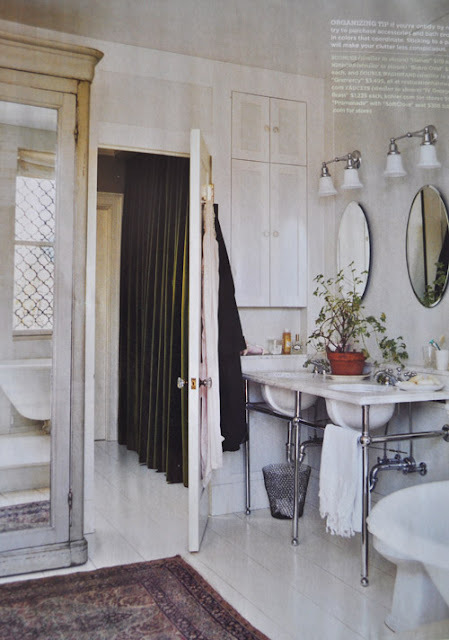 You'll have to look closely to see the quatrefoils in this photo from the June/July 2007 issue of Domino Magazine that I discovered today on the dress, design, decor blog. Reflected in the mirrored cabinet is a leaded window with quatrefoils forming the pattern of the leading. When I read the Things That Inspire post about Ray Goins, the image that stood out most to me was this Gothic-inspired swing with quatrefoil cutouts. I was able to get an in-person glimpse of the swing recently when the house it is located at was on the Cathedral Tour of Homes. Its unique Gothic design really captures your attention. Speaking of Things That Inspire, recall that I mentioned a business name being inspired by quatrefoils. Quatrefoil Design is the name of Holly's intaglio business. I recommend checking out her wares. She has an excellent product at an excellent price point. The quatrefoil image at the top of this post is of a decorative radiator grill from The Radiator Cabinet Company. The quatrefoil motif really is quite prolific in design! This is a fantastic collection of images and information!!! I've amassed quite a few examples of my own and it's so fun to see yours. Love Holly's biz and have been talking to her since December about purchasing some for myself and maybe a client now. Good eye. Next you'll have me searching for trefoils, and Cinquefoils. Here is a cinquefoil arch in Morningside near Fat Matts. Until your post I didn't know what to call them. I like how old design ideas stay new. Of course, I love this post - I have been a fan of the quatrefoil shape for many, many years. I set up my business name in 2007, before the resurgence of the quatrefoil over the past 3 years. I think it is because I have always had a side of me that loves the Gothic inspired shapes and designs. I have not seen most of the pictures in this post, so it was especially great to soak it all in! I am intrigued by the Gothic kitchen, which has some elements of the kitchen and eating area that is being planned for my new house - not in the Gothic motif (I asked Stan if we could do a quatrefoil somewhere, and he told me that it did not work with the style of house I am doing), but in some of the layout. I love that little interior window that is above the sink! Very clever. It would have been prettier if it were a quaterfoil, don't you think? Or at least had the shape of a quatrefoil within a circle? Suzanne Kasler has numerous quatrefoil inspired products in her line for Hickory Chair. 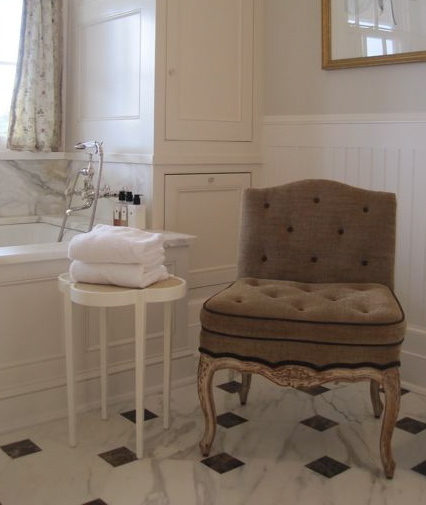 The Alexandra chair is the best seller in the line (I saw one upholstered in yellow at 22 Chatham), and she has a lamp and sconces from Circa with the quatrefoil shape. Love quatrefoil, it is timeless as is the gothic motif! LOVE this post, it has been a fun and bright read on this snowy morning! Thank you! Fun post James! I have been noticing them too - must be we read the same blogs. Have you seen this quatrefoil table lamp at Circa? wonderful collection....I love the quatrefoil motif as well. I want that Ironies table for the side of my bathtub! i love this clover shape too and wonder if fashion lead the way on this trend? Van Cleefs re-issued their iconic Alhambra line from the 70's in 2001 and I've noticed it in clothing, fabrics, ever since. Heidi Klum tried to use the quatrefoil motif for her own line of jewelry recently, but Van Cleef and Arpels has a patent on the design and wouldn't allow it! Bit of celeb trivia! I had not seen many of these photos and enjoyed seeing how this design element is utilized in homes. And I am beginning to take notice how much more is being offered in retail lines that feature the quatrefoil too. The Oomph and Ironies table are just lovely and I love what Suzanne Kasler has done by incorporating quatrefoils in her furniture line with Hickory Chair. I love, too, how Things that Inspire has named her design business with her favorite design element. And thanks to her design business, I am becoming an avid collector of her framed intaglios. Your post has been very inspiring. @Terry: I've been noticing some of the other foil counts as well. @Things That Inspire: I hadn't noticed the window above the sink. Good catch. I've noticed that Suzanne uses the quatrefoil and greek key in a lot of her designs. I like her modern interpretations of the motifs. @Helen Young: I have indeed seen that lamp. @jvw home: I am in Atlanta. Let me know when you're coming to town. I'd enjoy meeting you. @serena: I have noticed the quatrefoil showing up in fashion and jewelry lately too. I end up looking at a lot of women's fashion that I wouldn't otherwise because of the blogs I follow that have mixed content. Hello - I am a new visitor and really like this post. 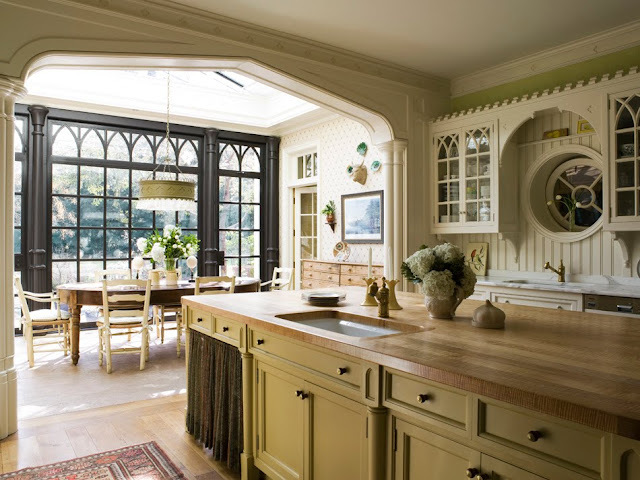 The kitchen/breakfast room shot by David Duncan Livingston is amazing - loving the configuration of the room and all the Gothic and general Medieval influences. I like that they have been updated and adapted to a more 'classic contemporary' look. The bathroom featured in Domino back in 2007 as well as the Ray Goins swing sofa, that to me feels a tad more Moorish than pure Gothic in its inspiration. However the two styles did merge back in history so perhaps both are fitting. Great post. Love your collection of images! What an excellent post... and a good eye as well. 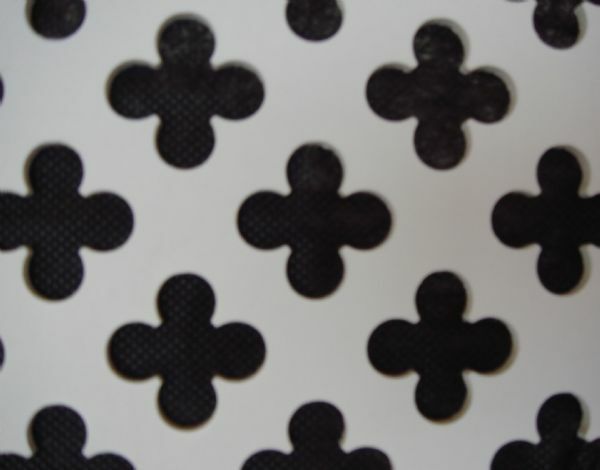 As I was reading through the post and looking for the quatrefoil I didn't always see it until you pointed it out! Way to go! I know how much Holly likes this post :) All beautiful. On a different note, do u know who the original architect was of the first house? I called Harrison Design, since they did the renovation, and they didn't even know... Thought you might. Great post. Loved looking for the quatrefoils in different designs! Love the quatrefoil design and just yesterday clipped two photos from a recent "Things That Inspire" blog with fantastic quatrefoil windows, one in a bedroom and the other more ornate one in a living room. Can't wait to have one of my own! @Charlotta: Thanks for stopping by. I checked out your blog and subscribed. Lots of great stuff there. @This Photographer's Life: I don't have any info on the architecture of the first house. I assumed it was a new build. This is an awesome blog, James. Not only do you find excellent examples of such minute details, your readers have excellent input. So glad I found you. Will definitely follow. Wow. I'm so glad to have discovered your blog. What an interesting post. You Americans do have an eye for detail, and some of the Atlanta houses you show are awe inspiring. I've just done a posting about a château near here, and as I looked at the mansions you feature I wondered whether there isn't an architectural link that has crossed one ocean and a couple of centuries?! I'll be back for more, thank you. 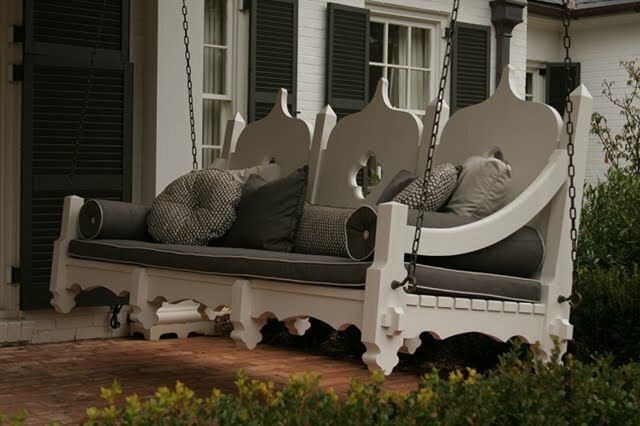 PS on the quatrefoil, my favourite has to be the swinging seat -I've always wanted one! 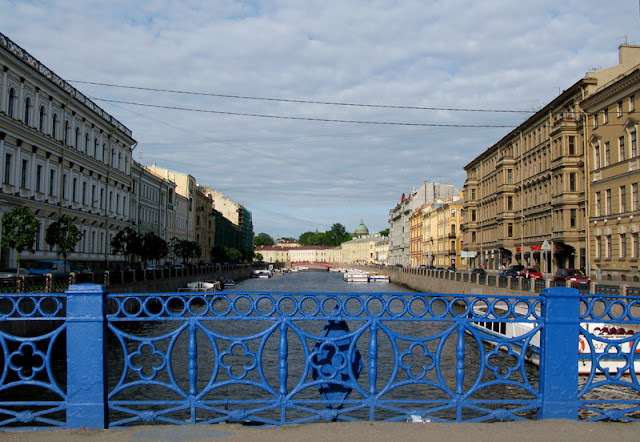 great piece-I especially love the St. Petersburg bridge, beautiful blue! I posted on a NYC townhouse that has some beautiful blue quatrefoil windows last month-when you have a chance, please visit! Great post, I love this symbol, honestly I can't get enough of it. Now that you've mentioned it I know I'm going to be seeing this motif everywhere ;) thanks for posting your picture collection is great! So glad I found your blog and this post. It makes me even more excited about the pendant lights I just bought today with cut-outs of quatrefoils. When I do the reveal on my blog, I shall have to link to your post! What a talented eye you have! I really enjoyed looking at the pictures. Especially the Gothic kitchen/dining room. I don't know if you would know this but those yellow dining room chairs are exactly what I'm looking for. Any idea where those are from or where I could get a lead on them. I noticed some Richard Mulligan chairs in one photo. Nice pictures, according to recent data the most popular ornament in US is considered "quatrefoil" which signifies the Irish 4 leaf clover.